Have you heard!? Mickey Mouse is turning 90 this year! And who are we kidding… of course you’ve heard, you do read our blog;) With Mickey Mouse’s 90th birthday this year, everyone has been joining in on the fun. 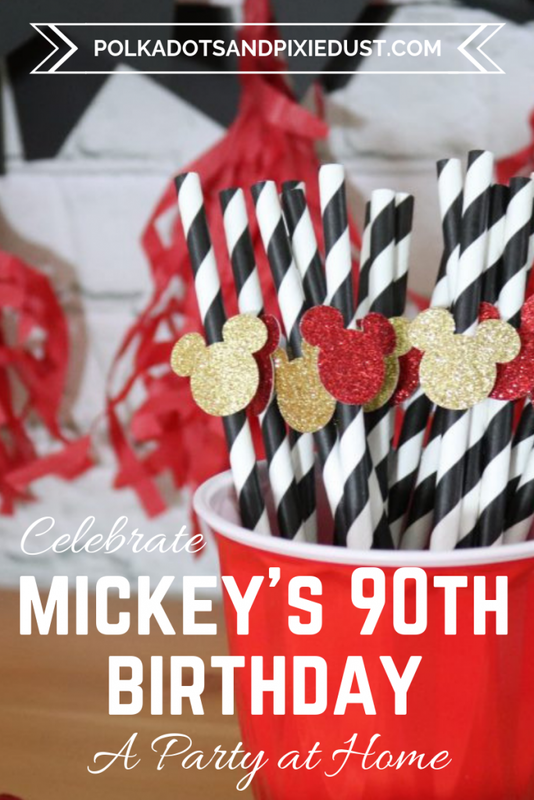 We decided to share a few ideas of our own if you want to celebrate Mickey’s 90th birthday in the comfort of your own home! 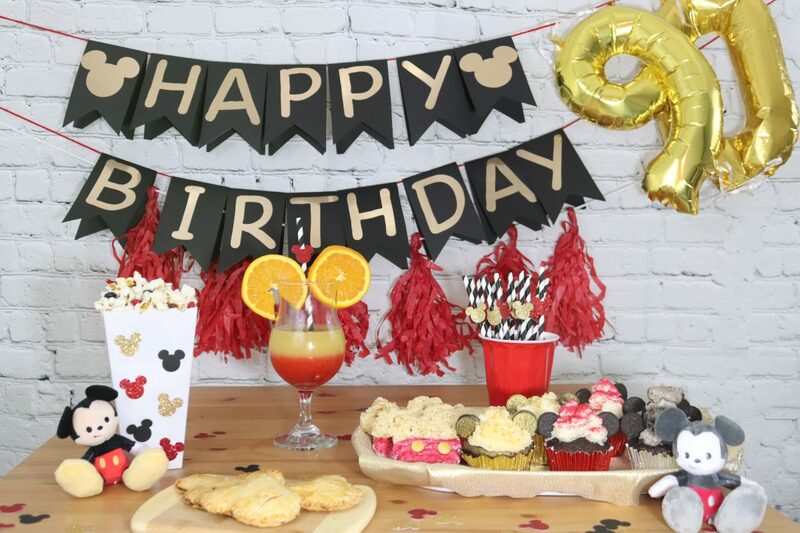 It seems like we are always hearing more and more about plans for Mickey’s 90th birthday party, so of course we had to have a little party of our own. 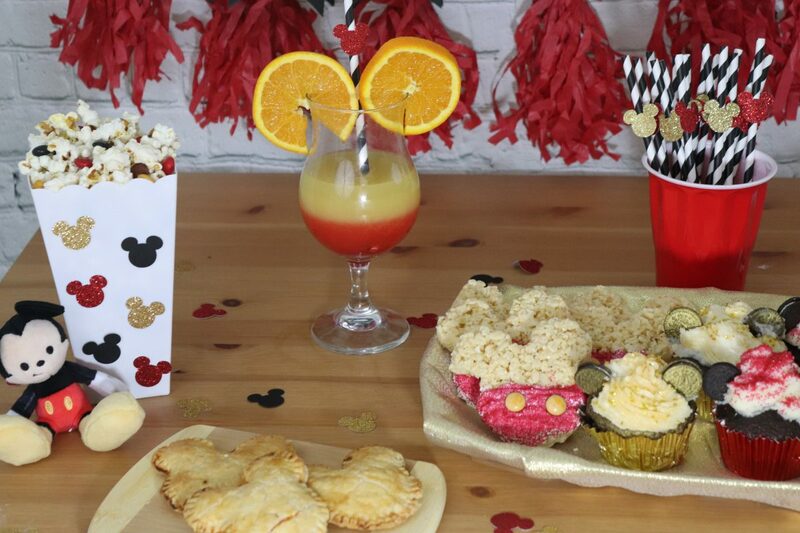 We realize everyone may not have the time or skill to create some of these mind blowing creations for a Mickey themed birthday party. So we decided to keep it simple, which trust me was difficult. You know how some people go all out for every event and then no one shows up? Yea that’s me. Kidding…. well kind of. Anyway, I am known for overdoing everything, so I did my best to keep things simple for this! 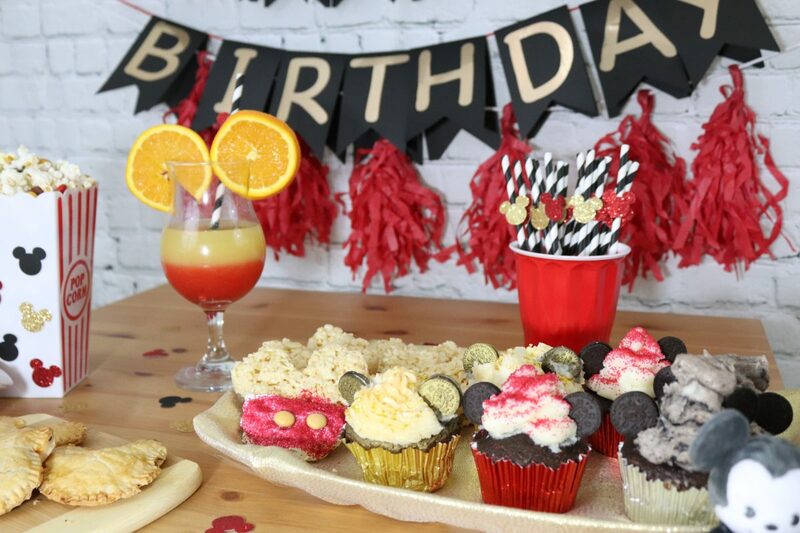 There are a few things you’ll want on hand that can really make party planning easier while allowing you to be creative, even if you’re not a “creative” person. 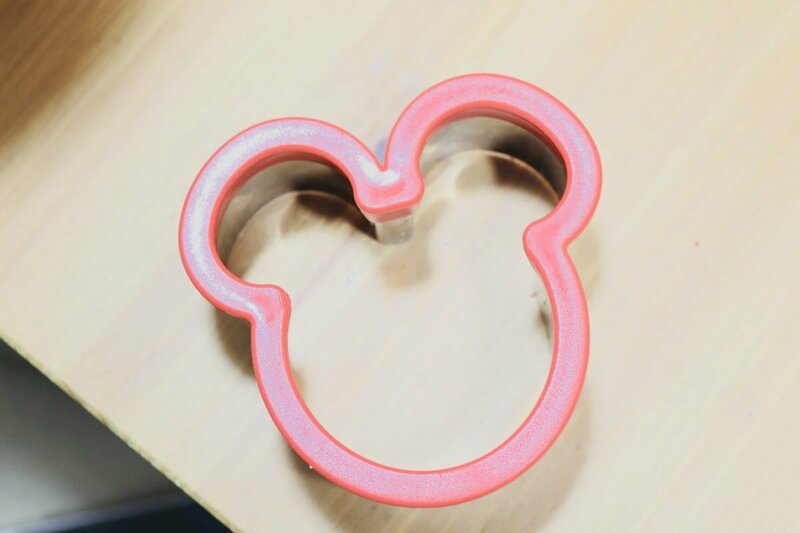 Mickey Mouse cookie cutter– this will be your new best friend for all things Mickey shaped! We use it for cookies(obviously), rice krispies, sandwiches, hand pies, the list goes on. Mini Oreos– need to add ears to something? 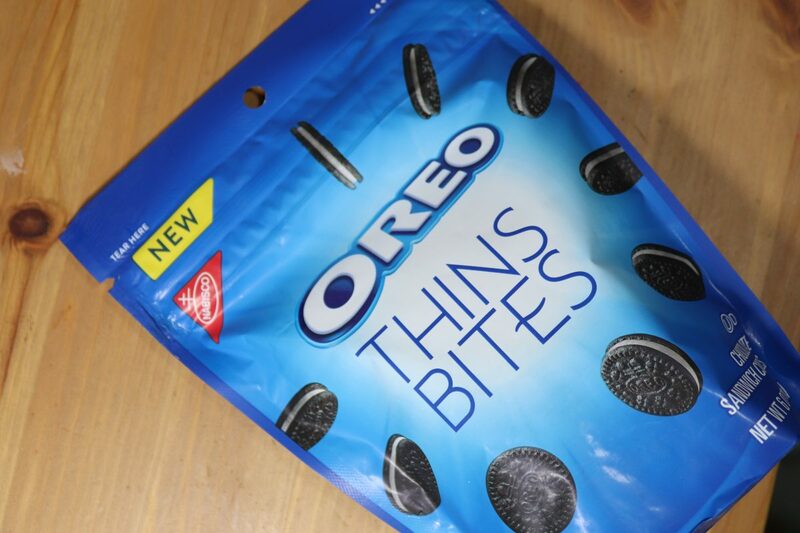 Mini Oreos do the trick. Or if its a bigger something, regular oreos work too! If you saw our Spring Mickey Treat post, then you’ll know that mini marshmallows can sometimes do the trick too! 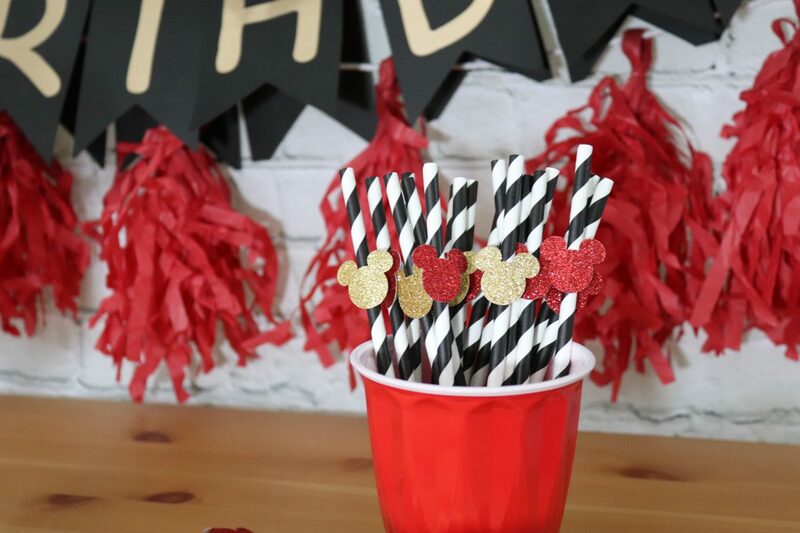 Black and Red Glitter Cardstock – keep the classic colors on hand to add a little bit of Mickey Magic anytime! There were a few things we bought specifically for this celebration. 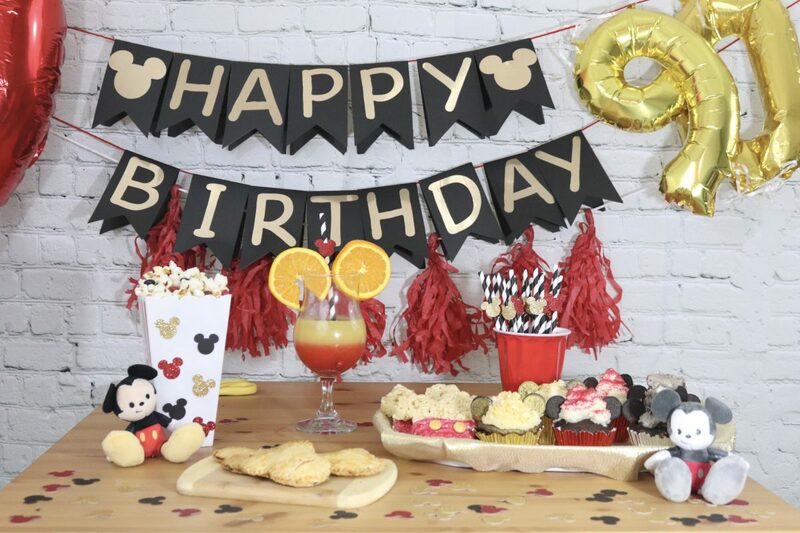 Since gold is the color of all things Mickey’s 90th birthday, we bought a few simple gold things to jazz up the celebration. 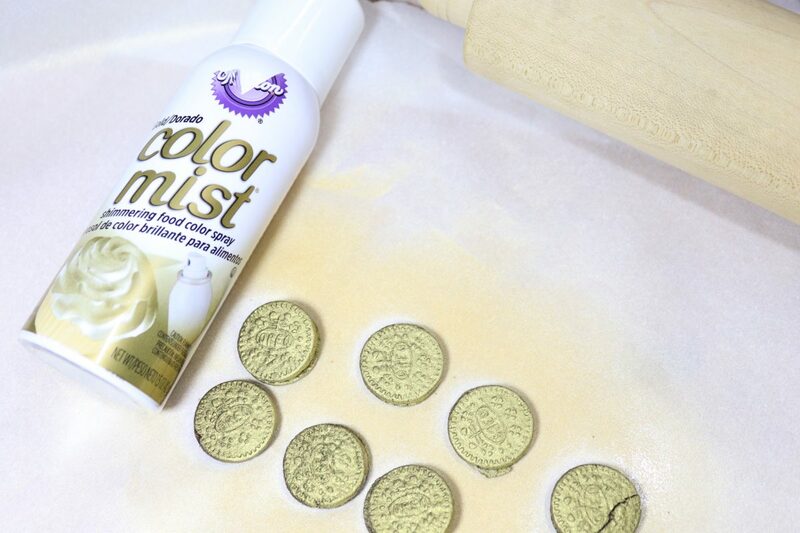 Wilton Gold Color Mist – use this to add some shimmer to cupcakes, cookies and more! We linked it to Amazon so you can see the product, but its available at JoAnn Fabrics for about $4 for one can. Gold Inflatable Numbers – we actually got these in the Target dollar aisle, but you can find them on Amazon for fairly cheap as well. 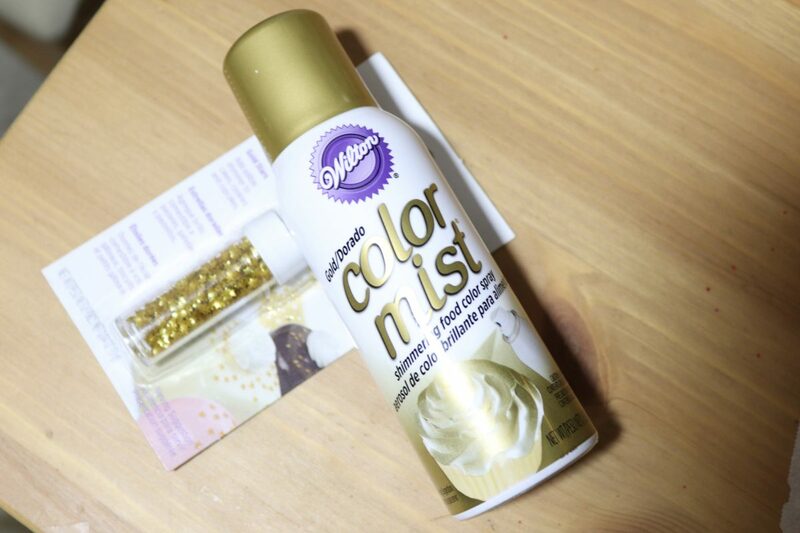 Gold Metallic Cupcake liners – we were actually lucky enough to find a multi pack that had red and silver as well and we found those surprisingly at Marshall’s! Feel free to pick and choose as you see fit and use these ideas as inspiration! 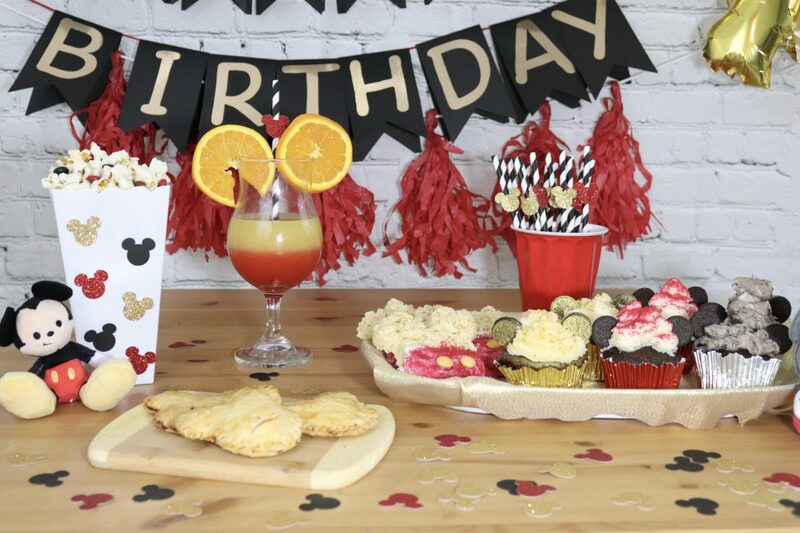 We tried to keep the color scheme for Mickey’s Birthday Party simple and classic, like the mouse himself! We stuck with black, red and gold, and of course had to add in shades of silver and gray to pay homage to Mickey in the black and white short films from 1928. To create the Happy Birthday banner, we used black cardstock, gold vinyl and some yarn to hang it up. Super easy and we were thrilled with how it turned out! We used our Cricut to cut it all out, so it was a fun and easy little project. We also used the gold number balloons mentioned earlier as well as larger red number balloons to really elevate the décor. You could also add red and black crepe paper, regular balloons or red, gold or black hanging fans . The best part is you can be as simple or as extravagant as you want! You can’t have a party without food! If you’ve been following us for any amount of time, you’ll know we are all about food. We come from a large Italian Family, so many of our get togethers and holidays actually revolve around good food. Since we were keeping it simple, we decided to stick to a little savory, a little sweet and a cute drink. 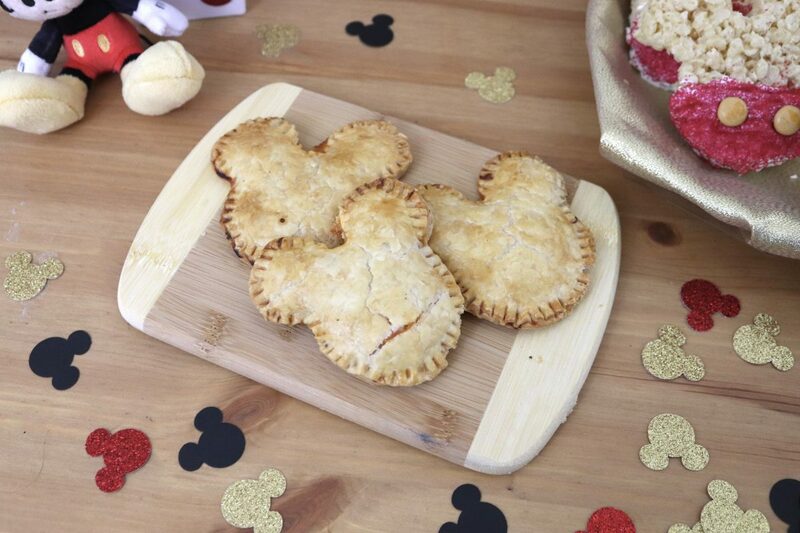 For the savory food, we made Mickey shaped pizza pockets. These are so simple and are hard to mess up. 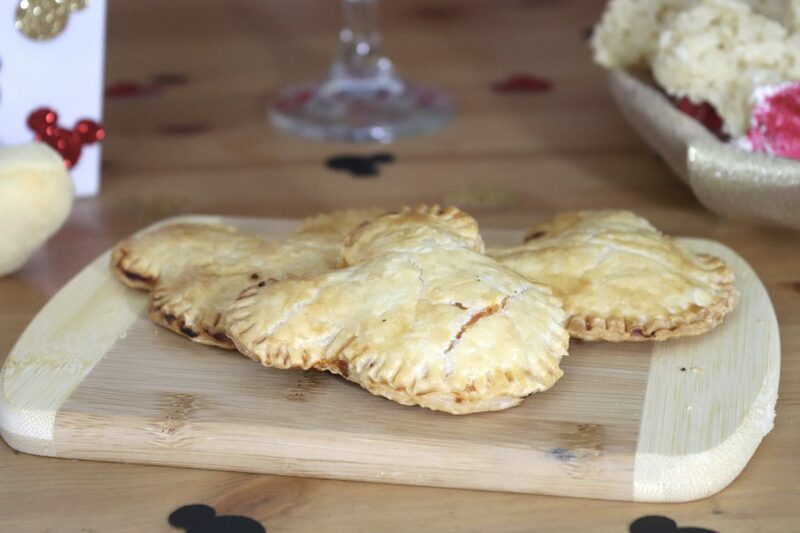 To make these, just buy refrigerated pie crust. Unroll it, and use your Mickey Mouse cookie cutter to cut out mini pizzas(two for each pizza pocket). Assemble the pizza using any toppings you’d like, then top with the second cut out, seal with a fork and cook about 15 mins until brown. Easy and delicious! To add some sweetness to the mix, we chose to represent all eras of Mickey Mouse with 3 different cupcakes, silver, red and gold. Again, we tried to keep this simple. To make gray frosting, we added crushed Oreos into white buttercream to cupcakes in silver liners. For the red, we simply topped the frosting with red sprinkles in red liners.And for gold, we were happy to find some awesome edible gold glitter stars and gold color mist from Wilton(as mentioned earlier) and used gold liners. Add in your Mickey “ears” with the mini Oreos and Voila! 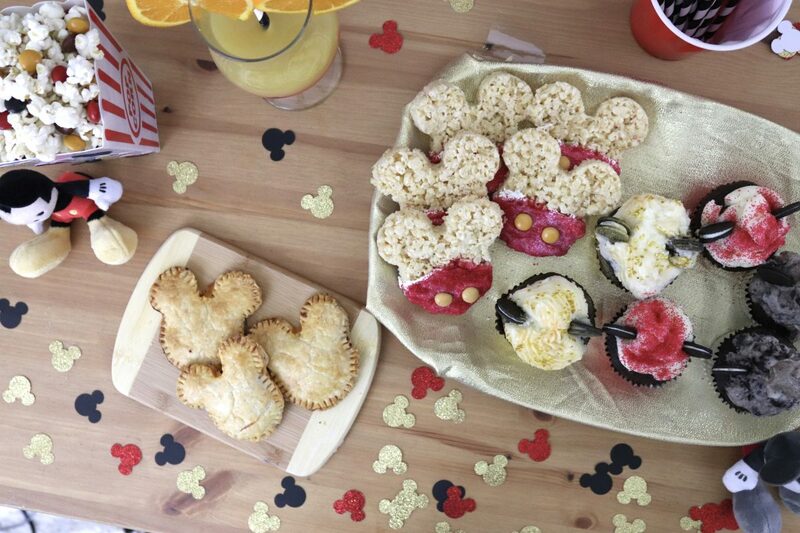 you have Mickey cupcakes. We had to have Rice Krispy treats at the Party since they’re one of our favorite treats to get at the Parks. 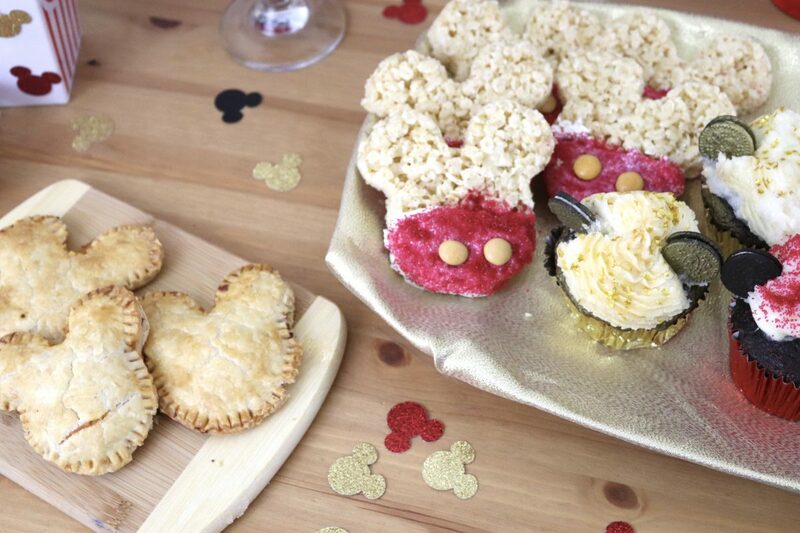 These are another treat you’ll want to use your Mickey Mouse cookie cutter on. Cut out the Mickeys and decorate! We stuck to white chocolate, topped with red sparkles and yellow M&Ms. But these are another treat that you can dress up any way you’d like! 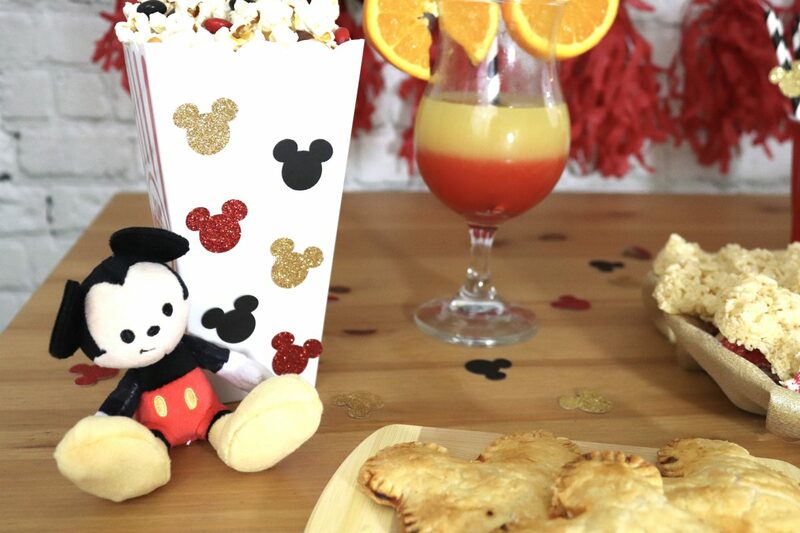 No party is complete without some delicious popcorn! 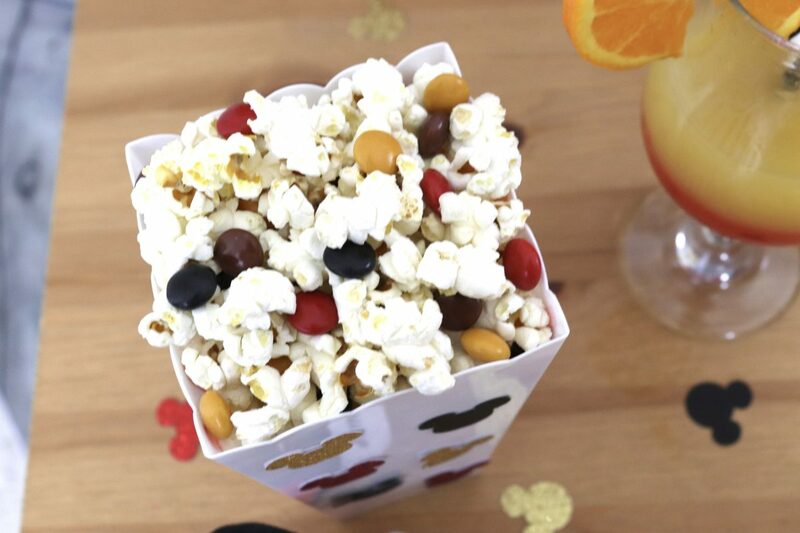 This popcorn mix was easy and fun and incorporated all of the colors of our favorite mouse. By adding red, yellow, black and brown M&M’s, this treat was a subtle nod to the Birthday Mouse without breaking the bank or taking too much time to assemble. To round out the celebration, we had to add a yummy drink! We stuck with non-alcoholic drinks for this, but actually took inspiration from this tutorial that is alcoholic. 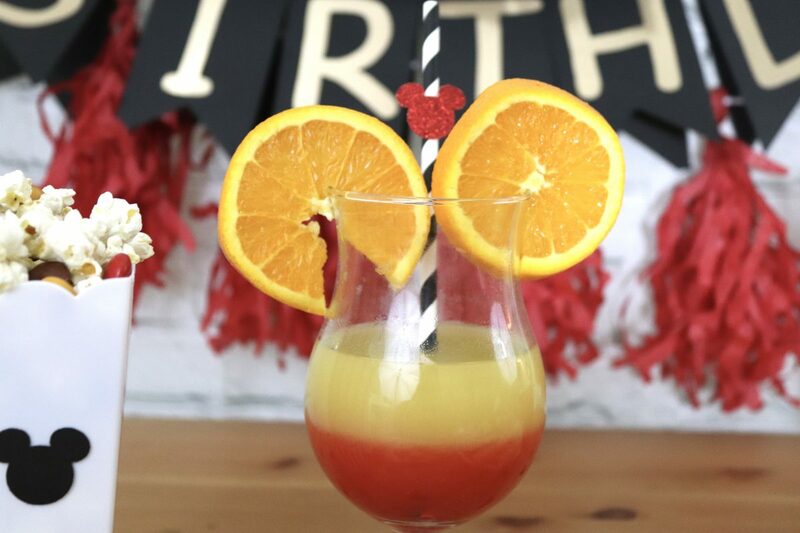 We substituted Pineapple Juice instead of OJ and cut out the champagne for our party, but feel free to follow the original recipe…..I mean really, who can say no to a mimosa?! 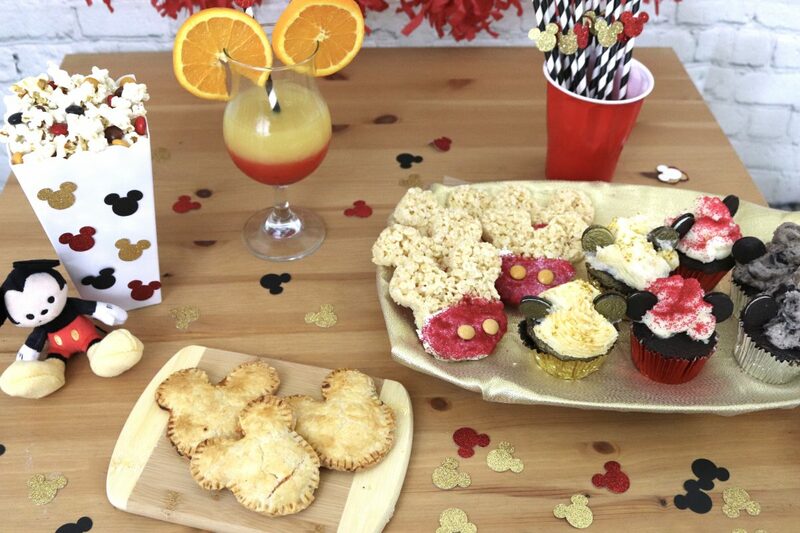 We topped ours with orange slices for Mouse ears and added a super cute paper straw that we topped with Mickey confetti. Put it all together and we were pretty happy with how it turned out. 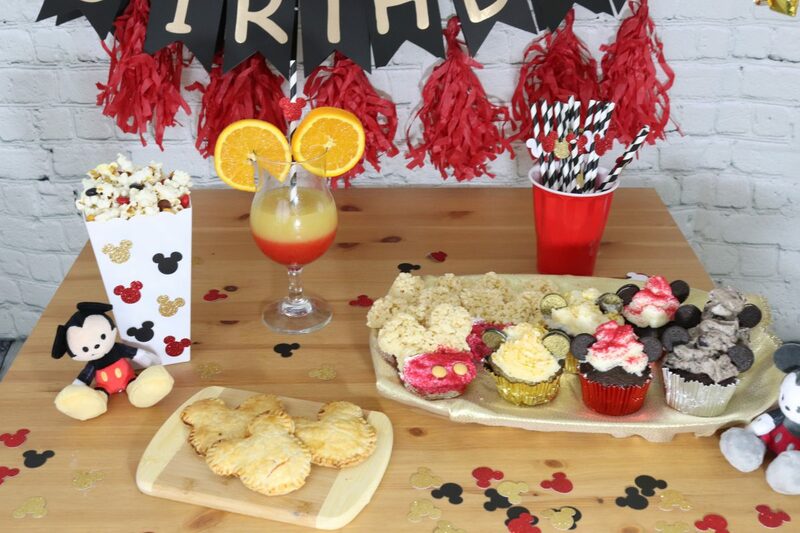 Add in some Mickey shorts DVDs, Disney trivia , or just some fun Disney music and you’ve got yourself a fun birthday Party for Mickey Mouse at home! So, do you plan to celebrate Mickey Mouse’s birthday party? What are your plans? Let us know, we’d love to hear your ideas!